A lot has been written about the Apple Watch. A lot will continue to be written about the Apple Watch. Apple has positioned it as their most personal product yet. Personal tastes are often subjective and sometimes polarizing. Polarizing would certainly characterize the tone of much of the public commentary thus far. 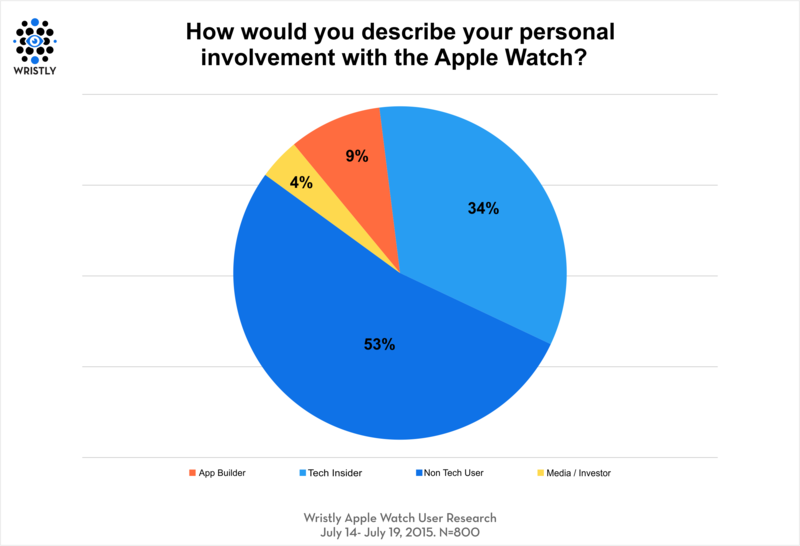 While the Apple Watch may be Apple’s most individual product, within the tech media it is certainly the most studied. From our own research, I had long questioned whether the heavy scrutiny by many in the tech elite was representative of the true mass market sentiment toward the Apple Watch. This was what the folks at Wristly and I set out to discover. As a researcher, one of the things critical to understand is the profile of the people you are surveying. With the Wristly Apple Watch Owner Network, we have over a thousand people on our panel. The belief, by many, was this first wave of Apple Watch buyers would skew toward early adopters. When we asked some pre-qualification questions to help us profile the panel, we found a healthy range of consumer profiles were represented. One of the best ways to measure how a product is being received by its owners is customer satisfaction. This statistic alone is highlighted by Apple continually as the barometer in which they measure a product’s success. Many pundits will look to Apple Watch sales as the metric for its success. But the real question is, do people love it? The answer is yes. It is common practice to add the top two boxes, which demonstrate satisfaction with the product, in customer satisfaction ratings. 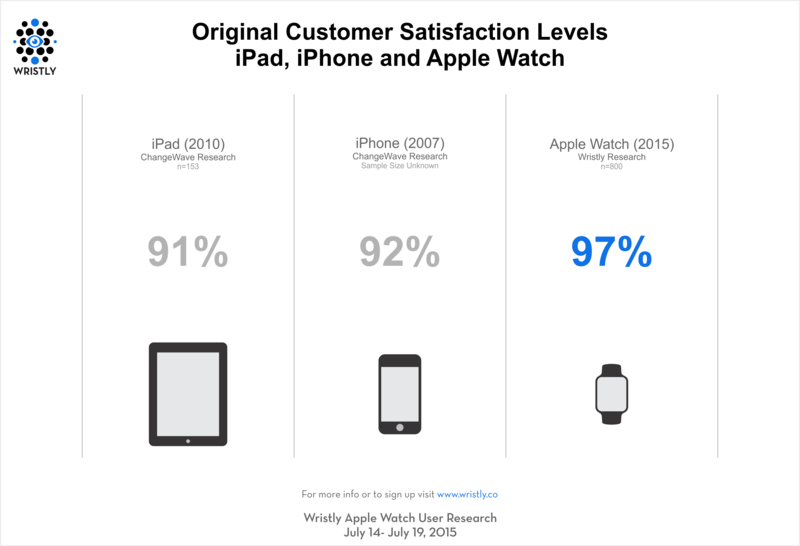 When doing so, we arrive at a 97% customer satisfaction level for the Apple Watch. For even more perspective, if we take a look at how the Apple Watch customer satisfaction rating compares to the first generation of the iPad and the iPhone, we see the Apple Watch has the highest customer satisfaction rating of any previous version one Apple product. Given the current customer satisfaction of the iPhone is at 99%, the first version of the Apple Watch ranks closer to the current generation iPhone than the first generation iPhone or iPad in terms of satisfaction. This begs an interesting question. Why does the Apple Watch have a higher customer satisfaction rating than the iPad or iPhone this early on in the product’s life cycle? Luckily, we have some observations and data to tell the story. I’m going to share with you what may be the most insightful thing I have learned to date about how different customers on the adoption cycle spectrum think about technology. What has been fascinating about the Wristly Apple Watch Panel is how diverse it is across the adoption cycle spectrum. We have those on the bleeding edge of adoption all the way through mainstream consumers who aren’t buying it for the sake of Apple fanaticism or love of tech and gadgetry but because they saw the utility and usefulness of the product right off the bat. They are all represented in our panel. I’m not sure any other product, from early PCs, smartphones, tablets, smart TVs, etc., this early in their category life cycle would have given us the opportunity to survey and talk to consumers with such a wide spectrum of the adoption cycle represented. Around this same time, I was conducting man on the street interviews everywhere I saw people with an Apple Watch. I’d just ask them what they thought of the product. I’d often make sure my watch was hidden in the hopes they would treat me as someone genuinely interested in the product and looking for a recommendation on whether to buy it or not. I also interviewed, on the phone in many different locations, a handful of volunteers from the Wristly panel. What I discovered was quite fascinating. As I listened to 14 different people tell me about their Apple Watch, I observed a pattern. Those whose job it was to think about the Apple Watch or who were early adopters who thought deeply about tech and the tech products they buy, were all much more critical of the watch. You could tell they evaluated it and thought about it deeply from every angle by their responses. Then I talked with teachers, firefighters, insurance agents, and those not in the tech industry and not hard-core techies. These groups of people couldn’t stop raving about the Apple Watch and how much they loved the product. It was almost as if the farther away people were from tech or the tech industry, the more they liked the Apple Watch. As we filtered the customer satisfaction answers by profile we saw something that fit this observation. 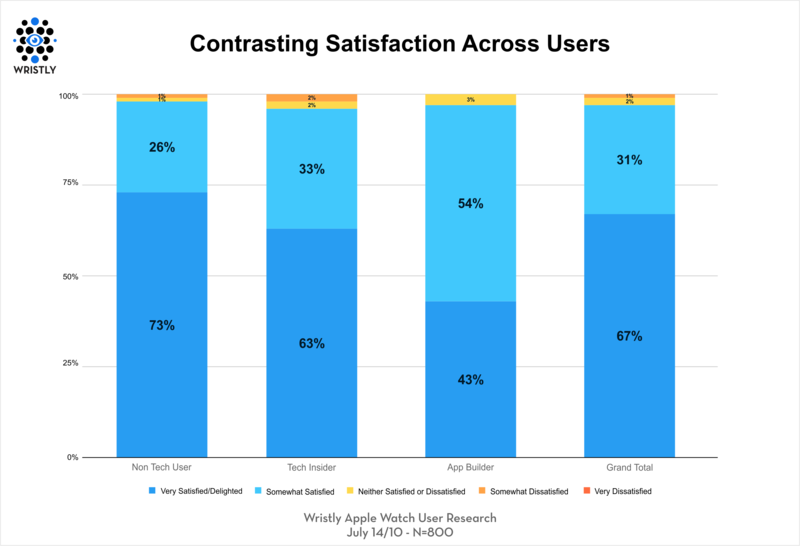 While every profile ranked high in one of the two top satisfaction responses, it was the non-tech users who ranked the highest for “very satisfied/delighted” by the Apple Watch. While we don’t know exactly how many Apple Watches have been sold what we can measure and use as a barometer to judge the success or failure of Apple Watch is if current owners are happy, satisfied, and delighted. For that we can safely conclude the answer is a resounding yes. 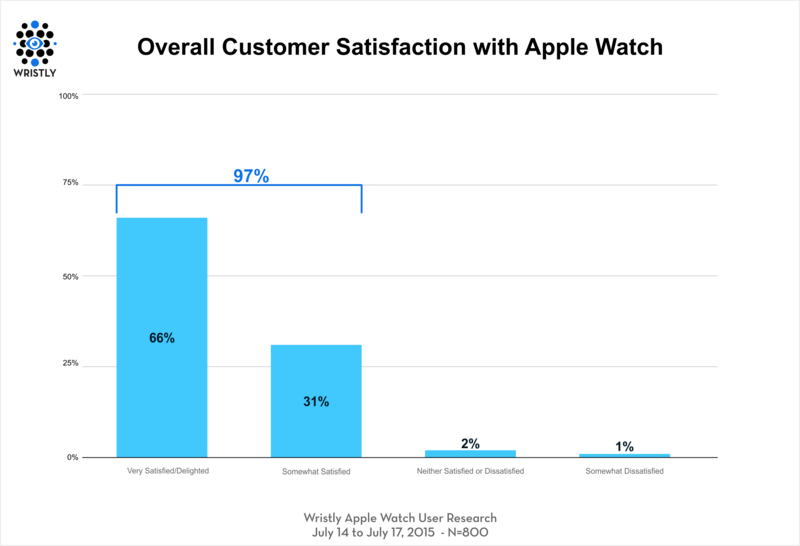 For the full Apple Watch customer satisfaction report, you can download it here from Wristly. Also please join our Apple Watch panel if you haven’t already for insights and full reports.